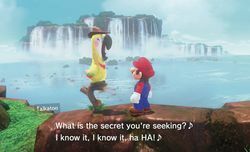 Talkatoo is a parrot from the game Super Mario Odyssey. He appears across multiple kingdoms and likes to gives names of Power Moons to Mario when consulted. Talkatoo's message consists of this recurring sentence: "I can't tell you, but I'll give you a clue: (name of the Power Moon) ♪ It's hiding somewhere and no peeking! ♪ Go find it, go find it, scra-CAW!". During the fight against Mollusque-Lanceur, however, he merely squawks in fear. He is mostly yellow in color, has a black beak and has a brown explorer's hat with a white feather in it. The feather is yellow at the top. His name is a portmanteau of "talk" and "cockatoo." Spanish Cotorrete From "cotorra" (parrot), and "-ete" ending (little, or despective). If Cappy flies near Talkatoo, he will squawk endlessly until Cappy moves away. This page was last edited on January 20, 2019, at 09:47.